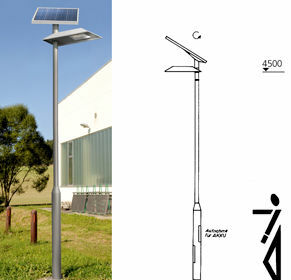 The manufacturing and use of solar luminaires is one-step into the future of outdoor lighting. Associated with it comes environmental relief, demonstration of environmental awareness as well as effective energy management. Solar lights work autonomously. Adjustments to the latest usage requirements are possible at any time. Cable trenches, cable routing and a connection to the power supply system is not necessary. Recommended fields of application are motorway car parks, parks, remote street crossings as well as bus stops, shelters, Golf and camping sites and for self-sufficient objects lights.